Can you go home?… a look ahead to Outlander 3.5 “Freedom and Whiskey” – My Outlander Blog! I’m continually amazed that I haven’t run out of things to write about Outlander. Every time I think I’ve gone to the well one time too many times something will happen…in real life that reminds me of something that happened in the books. And, once again, I am inspired to write. I marvel at the depth of the characters and story Diana Gabaldon has written. I wonder what she thinks of those of us who ponder and mine her stories and find,…well, what do we find? I find inspiration and truth, truth about life and relationships. The TV adaptation of Diana’s story has turned out to be no less engaging and just as full of inspiration and truths. Last week, we saw truths about life moving on after loss, how life doesn’t always go as planned, “…you will hear no in this world…’, how life can hand us unexpected blessings, the miracle of mercy, and self-sacrifice for the sake of others. This week our characters are all heading “home”. As a reader of the books, I know what is awaiting Jamie at Lalleybroch, but what the show has done so wonderfully is help me flesh out some of the things the book only touches on. In many instances, they have deepened and enriched my understanding of this story and its characters. This next episode appears to be attempting to do just that. The clip I saw of Claire and Bree looks to fill in one of those gaps in the book and more deeply develop my understanding of some of the main characters, specifically Claire and Bree. In the clip, Bree has decided to quit Harvard. She says she needs a break. She said her mother isn’t listening, a daughter’s lament worldwide. She says she has tried to be her old self. It isn’t working. I hope that there is more to this story arc because right now Claire is looking pretty self-absorbed. Really? She didn’t know this news might affect her daughter long-term? Think about what has happened to Bree. She recently discovered that she has been lied to her entire life about who she is. The father she loved isn’t her “real” father. He lied to her too. And, who her real father is is too unbelievable to be true and yet,… she saw Gellis go through the stones. Of course her life would feel foreign to her, she isn’t who she thought she was, no one is who she thought they were. She might understand her mother better, but that doesn’t take away the years that came before. The home she had and the person she was no longer exist. Brianna can’t go home. Jamie is finally going home to Scotland to the place that has always been his dream. The place where he had hoped to live a quiet life. He is happy to be going home to the bosom of his family, but it has been a long while and life there has gone on without him. He is not the same man who left, so many years ago. In some ways, he is better. He has moved on and made peace with the loss of Claire, but he also comes home with more loss. Most importantly, he is coming home to a place where he has no real purpose. The estate is no longer his and has been run for years without him. Claire isn’t there. William isn’t there. I’m sure they will be over joyed to have him home a free man for the first time in decades. But, I suspect the novelty of freedom will soon fade and he will soon face a predicament similar to Brianna’s …who is he…where is his place? Will he feel at home or will he feel himself to be an Outlander. Can Jamie go home? We know that Claire will soon be given information that will change the course of her life and I am so glad that it appears the show will let us see her grapple with that decision. It isn’t a small one. I’ve said several times since this season started that her choice to go through the stones was monumental. She truly doesn’t know what is on the other side. The decision to go will have to be made very quickly, there will a small moment of time in which they believe they know where Jamie will be. I’m so glad the show has decided to let us see Claire and Bree make that decision together. I want to hear what a conversation like that could possibly sound like. The regrets and grief she would have about leaving her daughter would be real and her doubts and fears about what she’ll find in that print shop would be real. I have no doubt that Caitriona will play them all to perfection. Have I said how amazing the performances have been this season? Yes? Well, it bears worth repeating. They have moved me. Going to post my poem again because I can and because I’m feeling Claire’s insecurity and fear, but lord I’m excited to see it all play out…..
Great words. Love your writing! Having trouble leaving a thank you on your latest blog. Truly well put. Loved the first paragraph especially. Your insight is marvelous. The real people that Diana has created. I love the truly personal moments in their lives. My only worry in this wonderful season is that we find out about a certain someone before Claire. I hope the book is adhered to in this. Wonderful writing! I have never followed a blog before so happy that I am~ Thank you for putting my own thoughts into words. TY! I’m glad you found me! I’ve sent this message to Herself, and now to you. In this world today, it is easy to feel dispair. I watch the news and read the newspapers and get more and more disillusioned. In order to remain sane, I read my Outlander books or listen to my Outlander books or watch my Outlander episodes. They always give me hope! All of your essays convey the multitude of emotions I feel day to day. They are insightful, not critical and bring the truth to me that an Outlander perspective on life is one worth living. Thanks. I feel exactly the same way. Claire is so brave. I admire that. Not sure if you could love enough to leave your children and that responsibility but obviously it is possible. Outlander land has helped me through so many trials and tribulations. I love reading just the day to dayness and wish we had a world like that. Sometimes I want the action to stop for a few more chapters while I just soak up the fabulous descriptions of the life and times. Thanks Beth for your reflections! Always insightful! I agree Beth that was well put. When I first read about that in Voyager I also wondered if Claire had a Plan B when she went to find Jamie, just in case it did not turn out. As well, later on at Lallybroch when all was revealed, I wondered again if she had a Plan B to enact but we did not have know as it turned out. Thanks, I really like your Blog. thanks! And thanks for adding to our convo! Enjoyed reading this blog. Your comments are touching, insightful and heartfelt. Love the poem! Thank you. Love your article, it reflects my feelings as well. I was pleased that the episode showed more detail of Jamie and Willie’s time together as he was growing up and how close they were. My memory of the books is that Jamie needed to keep more physical and emotional distance to Willie. Hoping to see more depth to Bree, so far I do not feel the connection to the character. This Sunday may change that and your insights are helpful. Being a mother of two daughters, I have wondered how Claire could make the decision to leave Brianna. My daughters are created differently. One is more confident and strong. The other, shy and a bit needy. Both absolutely perfect in their own ways. But while leaving one may be easier, leaving the other would be unthinkable. For me. I believe Claire recognized that Brianna was strong and capable and grown. And Brianna, while afraid and saddened about losing her mother, knew that her mother would be ok and alive and with her father, Jamie. Hmm, Plan B. There might not ever be a Plan B when Plan A seems the only plan to go by. Except this theory does get a bit tested … no spoilers from me. I keep going back to the first episode of Outlander when Claire was looking at the blue vase in the shop window. She said something to the effect “even after all the pain and heartbreak, I’d still make the same choice.” Her choice is made – the story continues. I am a happy person when I see an email from you. We all keep thinking Outlander and this incredible story – you get to put these thoughts into words. Thank you, Beth! I actually went back and watched that very first scene for that very same reason! 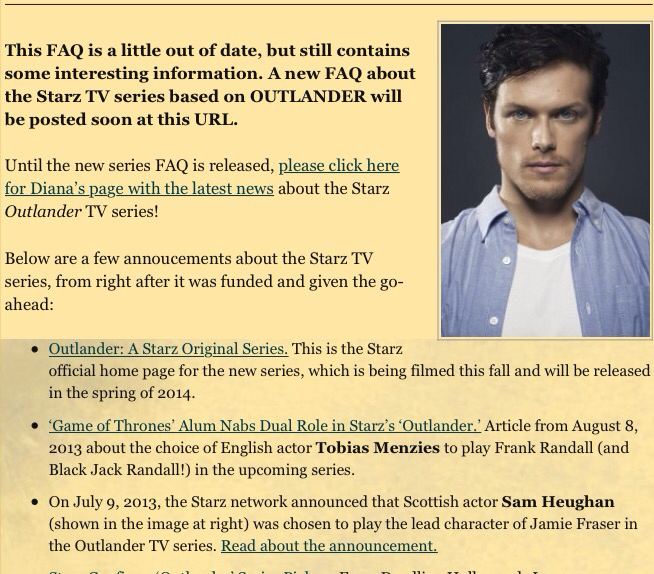 I think from the clip that they might be establishing it is okay because Brianna was moving out anyway…we’ll see. Glad you like those emails! I also think Claire was somehow comforted “knowing” Roger would be there if needed. (And boy, does that ever sound old-fashioned!) Of course, Brianna had her own agenda. It just goes to show that there are many types of mother/daughter relationships. I know a lot of people are questioning Claire right now. I’ve come to accept that whatever the circumstances, it ended up working for them. Brianna will eventually make her strong presence known. Like you said, she is very suddenly thrust into a very difficult and unbelievable situation. But her maturity and blend of her mother and father work well for her to handle it. Gosh, can’t help finding more things to say. I know you understand that. 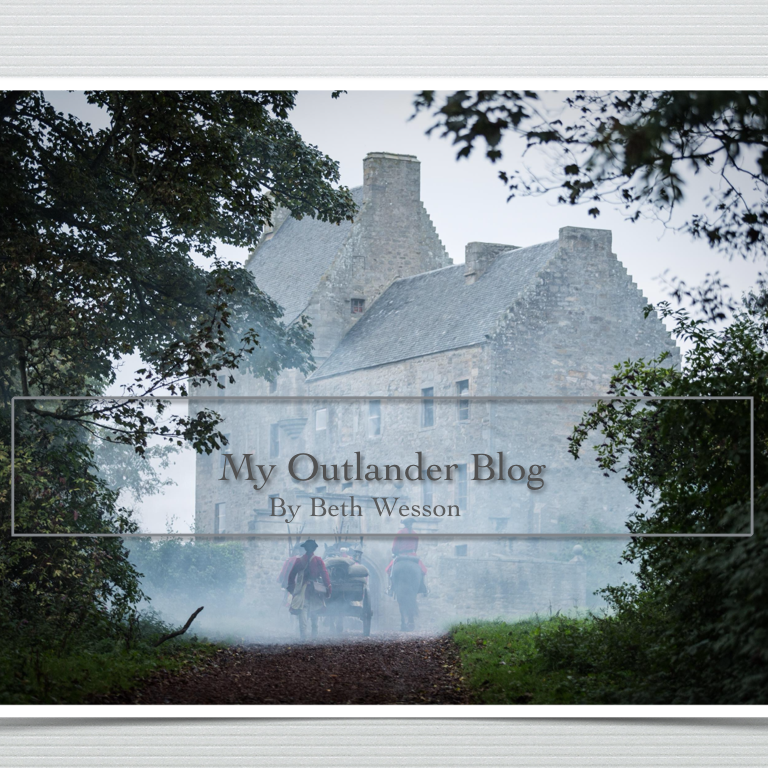 Thanks, Beth, for reading the ramblings of a die-hard Outlander fan. I always enjoy your thoughts. I was thinking recently of how some fans were complaining about or saying they weren’t liking Claire because she was coming across selfish (said similar in the past about Brianna too), but that’s pretty human, and a quality most people have–and need sometimes. Can’t be too perfect and be believable. I’ve loved what I’ve seen of this season to date–it just seems to get better and better. Great insights; thanks for sharing. I know. We all have our ideas and beliefs and there are some fans who believe the show has changed the characters character. I don’t feel that way and I think you are right. The imperfection help make the performances and story more nuanced. And takes a step…oh, what a scary step! I am one of the people who thinks Claire is coming across as selfish. I stick by this. She seems cold and remote, not at all like we have been used to. Bree thinks her mother has been living on another planet. So Bree must have felt like this most of her life. I say to Claire, ” for Gods sake this is Jamies child, your only real reminder of him. Cherish her for his sake if not your own.” Well that is a bit late now. I think that is why she is able to make the decision to go back. At this point I don’t blame her for that. She is not happy and wants a chance at happiness. I think that she took 2 years to make up her mind. So it was not an easy decision and Bree helped her with that. Claire comes back to us all when she is with Jamie. I completely understand your viewpoint. We must remember, though, pages upon pages of Claire happily raising and even clinging to Bree as the last of Jamie would bore everyone to tears. Without all the adventures, there is no story to read. I know I read to go on other people’s adventures and learn different viewpoints than my own. I try to remember that these books are close to 1,000 pages each. Diana gives us beautiful insights to make these people as human as possible. But never boring. I am enjoying your musings about Outlander. It is a story that has captured my heart and intellect. Your writing is nicely done. Beautifully Written. Looking forward to seeing how it all plays out! I dont see Claire as selfish, and I dont suppose that all women have loved a man as Claire loved him (his heart is her home) I myself have and I feel her aloneness, even in a crowded room.As parents,we have to let our children go at some point and even if we dont, they will leave us. So , while I sympathize with her angst of leaving Bree, I cheer for her to GO<GO<GO. And I eagerly await the day I return to my hearts home. As the mother of a much awaited daughter after 4 boys (including 2 stepsons) I think Claire’s eventual viewpoint is eminently justifiable. We parents are critical to our children’s well being in the first 20 years of their life but after that, we are moved off center stage to a minor supporting role, even a bit part if they move any distance to establish their own career or marriage. Is it worth sacrificing a man’s love that fills all your days with joy for the few times a year your children make time for you in their ever busier lives? Luckily, it’s a choice most of us don’t have to make. We can have our partner’s love AND see our children and grandchildren. But if push comes to shove, everyone should understand that hanging on to a person only for their attendance at your wedding and occasional visit or babysitting when they could be living a fulfilling life with a RARE love would be purely selfish on the grown children’s part. Well put. My thoughts exactly. I was hit my Bree’s, “I don’t need you.” She did say, “Not like when I was little.” True. But that said what you are saying. I’ve seen so many friends turned into babysitting services and holiday dinner folks. Claire really needed to go back to her only love. As for Frank, they were just getting to know each other as they had no real time together due to the war. He was not very nice in the book. Many affairs. Racist. Claire had to go back. With you! Beth, you have a God given talent for language and I am so blessed to be able to read your thoughts. Jamie and Claire and all of the other Outlander characters that I have been familiar with for 20 plus years, are obviously friends of yours also. Thank you for your thoughts and your delightful way of putting them on paper. I can’t wait for Claire to take that decisive step back into Jamie’s arms. I am hoping a few things for the rest of this season. I am really worrying about Jamie – his aloneness and all you have said and how it is played out in the books. Worrying about seeing that. These characters are my friends for twenty years. I worry that Roger gets such a hard time. In some ways more difficult than Jamie. Jamie to me always retains his dignity and strength. Even if he has withdrawn or is angry. Thank you Beth for providing all of us a space to talk about these important thoughts. I don’t have friends around me engaged in Outlander so they think I am a fool. Oh Beth one more comment I wanted to make to get some understanding. I do feel the book characters of Jamie and Claire are a little softer around the edges. Of course that could just be the way I created them. Again it might just have been my reading but I did also feel whilst Claire was so brave and strong I didn’t feel this overriding feminist agenda in Diana’s books. Claire portrays an archetype free of the Madonna/Whore scenario and it is liberating. She does not do the princess thing both in terms of spoilt or in terms of wanting a prince. Neither is race and colour politicised themes to me. We are all just people. With a colourful, interesting life fabric. No judgement. No politics. Of course there is judgement and politics in everything, but sometimes it is nice to suspend agendas just to go along for the ride. Thanks again Beth. Your writings are a gift this Outlander fan cherishes. I love your blog! Your poem is making me weepy. I can just see Claire tucking her curl, being self-conscious about her looks, and hoping beyond hope she’ll find her Jamie. Makes me think maybe we should all take those chances we are afraid to take as we grow older. I’ve become practical, less impulsive. Sadly, I can’t travel through the stones to find Jamie, but maybe I can take that trip to Scotland. 🙂 Keep writing! TY! so strange, but I find myself taking more chances and being less fearless the older I get! Please keep writing! I love reading your blog, you always hit the target. TY Jeannie. No worries haven’t been able to stop myself for almost four years LOL! The performances have moved me too. Since I love Voyager so much, I was a bit nervous about this season. But, wow…they have done it justice, and I too look forward to what is to come. And your posts move me too as you seem so able to put into words what a lot of us are feeling and thinking. Thank you! Thanks Dawn. I know you are one of my faithful riders and it is appreciated! I, too, am enjoying the way the book has focused on things only touched on in the books. The relationship of Claire and Frank was particularly well done. A marriage struggling to find a true connection and ultimately failing. I don’t think Claire was selfish. She is an honest person who tried to live up Frank’s conditions and leave Jamie in the past. But for those who have loved deeply, we know that “the heart wants what the heart wants” and all our best intentions may not change our feelings. Thank you for your blog…it’s the only one I read and I am always smile when I receive an email from you. Thank you! I love hearing that folks enjoy what I write! As always Beth I gobbled up every word of your blog. This one has special meaning for me because I can see my real life experiences in Claire and Bree’s situation (LOL no Stones involved). As an immigrant to Canada I know what I feels like to leave everything you know and love to go unwillingly to live in another country. I tried very hard to fit in and find my place but soon realized that even though I spoke English I was an “Outsider”. This became evident when one of my work colleagues asked me if I wanted an ice cream sandwich. From the horrified look on my face as I tried to imagine putting ice cream between 2 piece of bread and butter she understood I had no idea what she meant. To me this was an ice cream wafer. A good laugh was had by one and all. I did manage to fit in but to this day, 46 years later, I know I will never truly be a Canadian any more than I can say I’m Welsh. I know how Bree feels. In the beginning I was so homesick and desperate to go back to Wales and everything I knew. Real life has a way of making decisions for you and it worked out that I stayed in Canada. On my first trip back to my “home” it didn’t take very long to realize that the ‘home” I missed so much was no longer there. The people and houses were there but in the scant 5 years I’d been away not only had I changed but so had my home town and all my family and friends. It was a very difficult notion to take in. I didn’t know where I truly belonged and sometimes still don’t. Thanks for making me understand that those feelings were not abnormal. Wow! I didn’t think my watching of the show or reading of the book could be enhanced, but you really opened up both. Also, you highlighted a dilemma in my life I had just been discussing with my JAMIE this weekend. Where should I go from here, and where do I fit in? I feel “obsessed,” but art mirrors and informs life. Thank you for you insights.